Features: 12-hour System 31 High Bright LED Lights Displays Month,day,week,hour,minute And Function Of Animation. 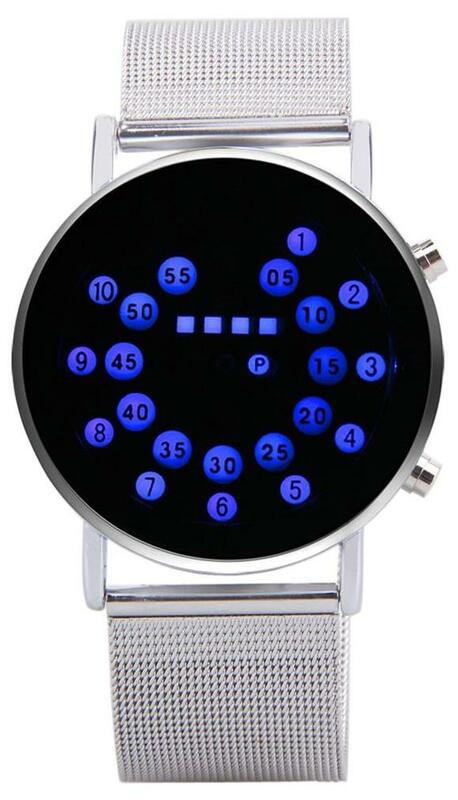 1 To 4 Level Bright Timing 5,10,15,20,30mins Lights Automaticly. Specifications: Item Type: Wristwatches Watchband Material: Stainless Steel Dial Window Material Type: Glass Dial Material Type: Stainless Steel Movement: Quartz Dial Diameter: 4cm/1.57"(approx.) Band Length: 23cm/9.06"(approx.) Dial Thickness: 0.7cm/0.28"(approx.) Band Width: 2.3cm/0.91"(approx.) Gender: Men Style: Casual Waterproof: Living Waterproof, But Not For Swimming Case Shape: Round Color: As The Pictures Shown Weight: About 63g Note: 1. The Item Has A Instruction. 2. Please Forgive 2-3% Errors For Measuring By Hand, And Be Sure You Never Mind It Before You Order. 3. As Different Positions, The Watch May Have Chromatic Aberration.